Inflation Pressures Heating Up, Again! The composite indicator that measures the trends in gold, crude oil, and yields on the 10 year Treasury will end the week in the extreme zone, and this should be a headwind for equities. Inflation pressures, whether real or perceived, are heating up. See figure 1 a weekly chart of the S&P500 with the indicator in the lower panel. 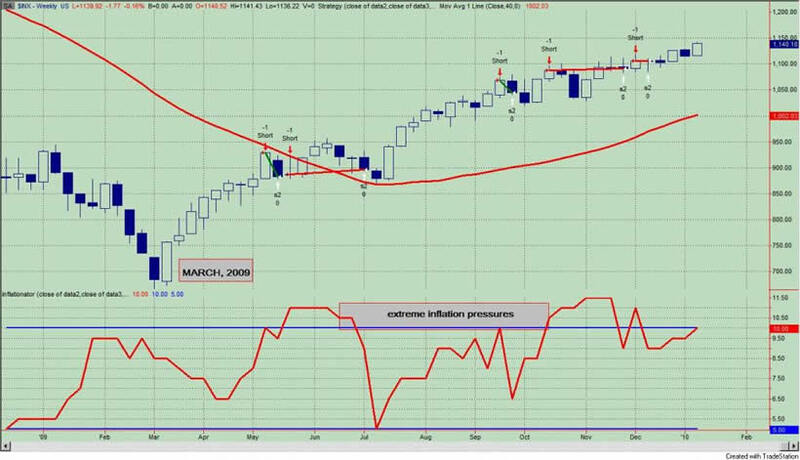 The rally that began in March, 2009 has stalled every time this indicator has hit the extreme zone. These are shown by the trade signals in figure 1. During this rally and over the past 25 years, strong trends in gold, crude oil, and yields on the 10 year Treasury have been a headwind for equities. I recently reviewed the use of this indicator as a filter for a simple moving average strategy in our series on developing a trading strategy. I would also recommend reviewing the article "The Faber Model and Inflation Pressures". Once again, this filter improves the efficiency of this simple trend following model. Lastly, let me make a comment to those readers who are looking for an indicator that calls every market turn all the time and it does so with the utmost of precision - the proverbial holy grail. If you are one such person, then this indicator is not for you. But in the imperfect world of the market or in a world where we try to apply order or structure to randomness, this indicator is pretty good in my opinion - and it makes sense. Hopefully and this is a word I don't like to use in my investing, these precuations will prevent us from losing dollars and cents over the next couple of weeks.